UFO – But Is It Any Good? WHAT’S IT ALL ABOUT: An almost not-quite breakthrough record that has some tasty hard rock but is dragged down by ballads. 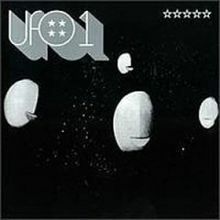 SOME WORDS, PHRASES AND CLAUSES ABOUT THIS RECORD: Firmly establishing themselves as a hard rock band, featuring the guitar wunderkind Michael Schenkre, UFO almost struck paydirt with the fantastic “Shoot Shoot” and “Let It Roll”, getting airtime on late night TV and some radio airplay. A very dry production (so dry, you can almost hear the kick drum pedal squeak) emphasized the basic tracks – especially Schenker and drummer Andy Parker, while Pete Way’s bass holds down the bottom and stays out of the way. No doubt it sounded great on 8-tracks blaring from muscle cars and Camaros and the like. But, it seemed that every hard rock band had to do ballads – not ‘power ballads’, but actual love ballads. Judas Priest did, Sabbath did (“Changes” lest ye forget), and here Phil Mogg gets his. While they’re tastefully done, they take away from the ROCK that was building up. We needed the rock then – as we do now. NOTES & MINUTIAE: The album cover by Hipognosis was controversial, and it actually featured Genesis P-Orridge and Cosey Fanni Tutti of Throbbing Gristle. IS THERE A DELUXE VERSION: Yes, an outtake and live cuts. GRADE: B: “Shoot Shoot” is an all-timer, but man, the ballads bring me down. OTHER SONGS YOU MAY KNOW: Nope. For a good reason, too. WHAT’S IT ALL ABOUT: First album finds the UK band straddling space rock, hard rock and blues rock and coming up with…nothing, really. SOME WORDS, PHRASES AND CLAUSES ABOUT THIS RECORD: I could say the sound and production is flat, but I know that they were on a shoe string budget. What I can say for sure is that the band didn’t quite know what they were doing, what they wanted or what direction they wanted to take. They dabbled in space rock, psychedelic ballads, boogie (with a song called “Boogie”, no less), and a hard rock band (their version of “C’Mon Everybody”). Pete Way’s bass is way out there in the mix, and though Mick Bolton’s guitar has some riffin’ moments most of the time he’s back there noodling with effect and wah-wah pedals. GRADE: C-: A riff here, a semi good idea there. A lot of noodling. A muddled sound. It’s not the UFO I want or need.